This is a private family cemetery. There is a bronze plaque in the wall which reads: In loving memory of my Father and Mother and loved Ones. Mary Thierer Mertz. The oldest stone dated 22 February 1861, is for Maria Bentz, mother of Margaret Thierer and the latest is for Edward George, infant son of Levi Thierer, Sr. who died at age 6 weeks in 1925. Note: This Family Cemetery is on Private Property and permission should be obtained before entering. Directions: From Manhattan, take KS-K18 to thet Skyway Dr exit. At the traffic circle, take the 2nd exit onto Skyway Dr for .3 mile. Turn right on Eureka Dr for 1.7 miles. Turn right on Wildcat Creek Road, continue one mile. Turn right (east) and follow the private drive past the house, into the pasture. 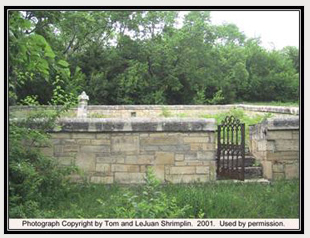 The cemetery is northwest of the house, surrounded by a native stone wall and over looks the Kaw Valley.